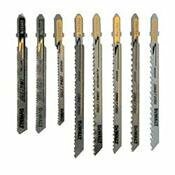 8 Piece, T-Shank Jig Saw Blade Set, Precision Ground Teeth Stay Sharper Longer & Deliver Smooth, Clean Cuts, Deeper Gullets With Increased Free Space Remove More Material For Faster Cutting, Cobalt Steel, Bi-Metal, Maximizes Blade Life & Durability, T-Shank Design Fits All Bosch & Dewalt Jig Saws. Great little pack of Blade. 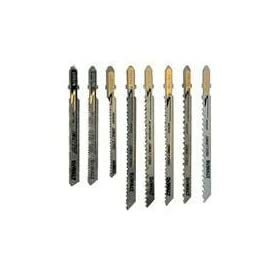 Like tools, do not hesitate to buy quality, you will win on the long run. Another good package from Dewalt. Like the easy change blades, nice "case" for storage, and good blade life. What a differance new (Sharp!) blades make. I was hating my jig saw, till I used these. I like my saw again! Its nice to cut straight lines again! This is a nice little general purpose set, which is great if you do a little of everything. This kit is a great addition to the new types of jig saws. All types of blades in one neat package.